The Dream of the Red Chamber, a masterpiece of Chinese fiction, is a detailed, episodic record of the lives of the members of the Jia Clan, whose good fortune is assured when one of its daughters becomes an imperial concubine, and then declines after her death. The story centers on a love triangle consisting of the main character, Bao Yu, his beautiful cousin Dai Yu, and his future wife, another beautiful cousin named Bao Chai. Bright Sheng and David Henry Hwang have adapted Cao Xue Qin’s epic 18th-century Qing Dynasty novel with a focus on eight central characters to tell the tale of the illustrious Jia Clan and traces the Jias' fall from the height of their prestige. Often considered as a semi-autobiographical novel, Sheng and Hwang frame the tale with a Prologue and Epilogue led by The Monk, who may be the author himself. The exquisite, soaring vocal writing reveals Sheng as a melodist of uncommon distinction. Sheng has a terrific feel for orchestration. He uses brass (particularly trombones), winds and percussion (Western and Chinese) in original and highly imaginative ways. Pitches bend in ways that sound almost acrobatically impossible. Chinese folk tunes get transformed into rapturously expressive new music, gorgeously colored. There’s a moment in Dream of the Red Chamber that creates an unforgettable tableau. A young woman, standing alone in a small boat, floats down a gently undulating river made of azure silk. Sheng’s score evokes the Chinese setting in swaths of orchestral sound: percussive outbursts, chattering woodwinds and string glissandi. Dai Yu’s alluring Act I aria is accompanied by the qin (a Chinese zither). Yet the composer employs a predominantly Western palette; one hears echoes of Bartok and Stravinsky in the opera’s forceful orchestral passages, arias and ensembles. …the score snaps into focus in a series of tautly constructed scenes that reveal the canniness of Sheng’s compositional strategy — in particular, his skill in crafting an operatic language that is a hybrid of Chinese and Western traditions. 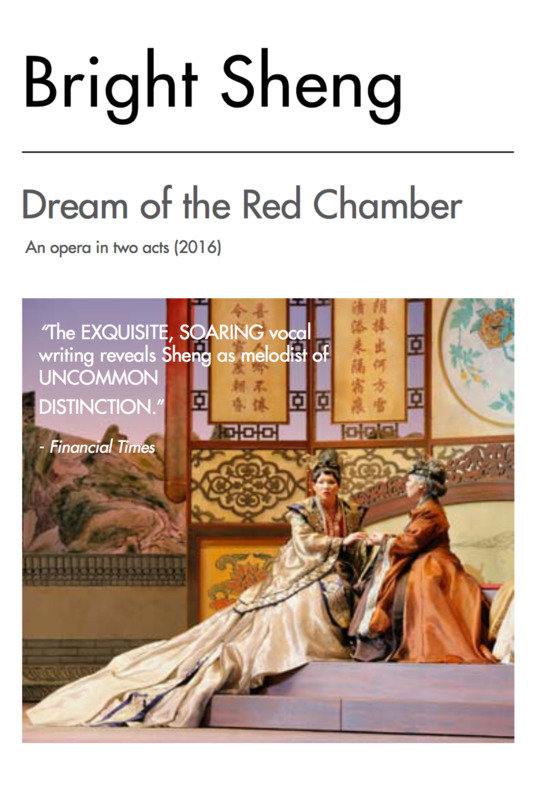 …Red Chamber is a gold mine of opportunities for vocal display, all of which were capitalized on by the Opera’s excellent cast. Dai Yu’s aria to begin Act 2, to take just one example, is one of those impeccable set pieces, elegant in both detail and formal design, that young sopranos will soon start adding to their audition lists, and Jo delivered it with consummate eloquence.